Belfast is a long way from the town littered with bullet holes that you saw on the news during 'The Troubles'. It's now thought of as a great place for a lively city break, or else home of the new Titanic Museum. These days the best places to stay in Belfast are a mix of hip haunts and glorious old traditional spots. The shimmering and angular Titanic Belfast museum doesn't just occupy a prime piece of docklands real estate on the site of the shipyard where the Titanic was built. It's also surrounded by its own quarter - the Titanic Quarter, a large scale regeneration of the docks and Belfast's incredible maritime landmarks. They've cleverly retained the huge cranes, Samson and Goliath, which were used in the construction of many great ships, and added several floating museums, including HMS Caroline. Beyond the Titanic are the relics of 'The Troubles', the white, pillared, neoclassical facade of Stormont, the Ulster Museum and Crumlin Road Gaol, which offer a fascinating reminder of this city's violent past. But these days there's more of a gentle melding of Irish and British culture, which makes for a unique city, totally unlike London or Dublin. Belfast's many years as a no-go zone means its relatively unspoilt and undiscovered. One of the best ways to discover Belfast is on one of the city's now famous Black Taxi Tours, where an experienced driver, usually one who worked through 'The Troubles' will show you their city, complete with personal details. Another very personal tour is the Belfast Mural Tours. But Belfast isn't just about history and grand Victorian architecture, modern Belfast is home to a number of impressive art galleries and plenty of buzzing bars. City Centre - A stay in the centre of town is ideal for those wanting Belfast's top spots right at their fingertips. The Cathedral quarter, whilst still very centrally located, is a bit more artsy and cultural. If you're on a bit of a budget but still fancy a fun time then consider Queen's quarter, named after Belfast's most prominent university. Visit the Titanic Belfast museum, an impressive tribute to the famed boat. For a reminder of the city's history make a stop at the fascinating Ulster Museum or Crumlin Road Gaol. Take a stroll through Cave Hill Country Park and enjoy the fabulous city views. Visit the bustling St George's Market, one of the city's oldest attractions (there has been a Friday market here since 1604), to sample local fresh produce and pick up some local crafts or antiques. Our pick of the best places to stay in Belfast are perfect bases for making the most of this fascinating city. 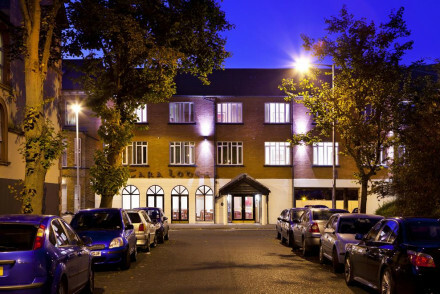 Ten Square in South Belfast is a fashionable boutique hotel in a Grade I listed building. 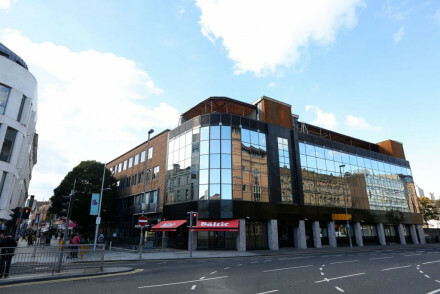 Central and hip, it has comfortable rooms and a popular steakhouse and bar and is within walking distance of many of Belfast's main attractions. 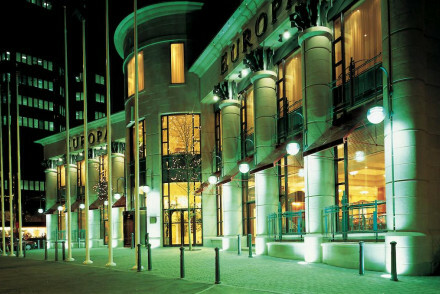 The Europa Hotel boasts smart rooms, a brasserie serving up delectable cuisine and a piano bar which specialises in high teas. Overall, a lovely stay. Formerly a 19th century bank, the Merchant Hotel is an eclectic and rather opulent conversion, harking back to the Paris of Napoleon possibly. Think silks, rich velvets and gold and chintz wallpapers. The Bullitt is a designer property, boasting a central location and featuring contemporary and quirky interiors with plenty of artwork adorning the walls. The Crescent Town House has just 17 elegant Georgian rooms, behind a charming 19th century facade. Plenty of regal reds and greens and antique furniture. It's great value. The award-winning Tara Lodge offers chic contemporary accommodation and hearty breakfasts - making it an ideal spot for a city break. 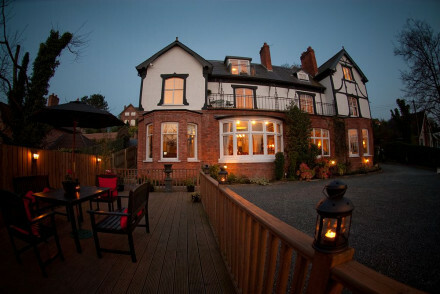 If you want the best of the city, but a bit more peace and quiet, then try Rayanne House, a traditional property in leafy Holywood. Here you'll find smart rooms and fab food, plus you're not far from the beach. 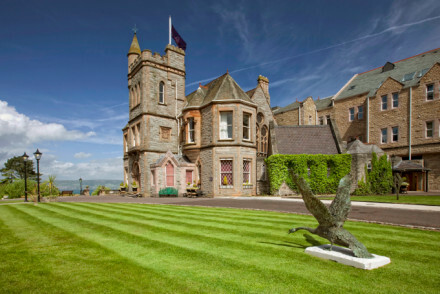 Culloden Estate and Spa is a luxurious hotel and spa overlooking Belfast Lough. Surrounded by peace, you're just a short journey from the centre of town. You'll be spoiled by the service and luxurious facilities. Three-room Peartree Hill is a quiet B&B offering spoiling countryside views and charming accommodation. The Victorian Maryville House is a smart stay located just a short distance outside the city centre. A good spot for a romantic getaway. If you've decided that a self-catering property would be more suitable for your holiday, we recommend you visit our online booking partner, Booking.com, where they have a wide selection for all tastes and budgets. Fly to George Best Belfast City Airport, just two miles from Belfast's city centre, or by train travel to Great Victoria Street Station which is located in the heart of the city. Ferries arrive in Belfast from several ports in Scotland and England. Belfast is a year-round destination, with each season offering its own charm. However, for the best chance at warm, dry days, plan your trip in the summer months (May-August). If you want to hire a car, we recommend you visit our online partner Rentalcars for the best prices. Browse through our list of all the best places to stay in Belfast. Expand your search to include all our recommendations in Northern Ireland. 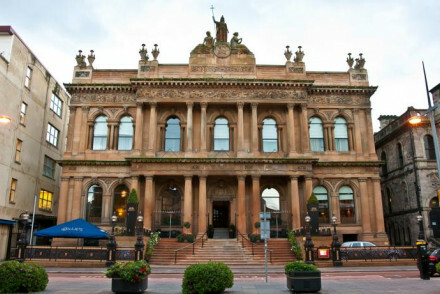 Fashionable boutique hotel in a Grade 1 listed building, located in central Belfast. 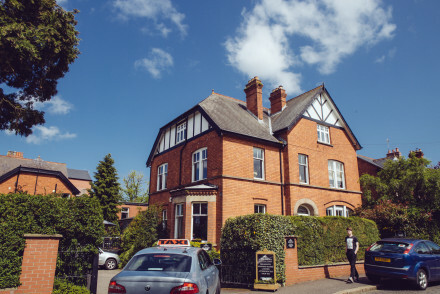 Comfortable rooms and excellent steakhouse and bar mean that this is the perfect place for relaxation after a busy day of business or pleasure in the Northern Irish capital. A hip spot in the centre of the city. Set in a lovely Victorian townhouse, Maryville House is a delightful B&B a short way from the centre of Belfast. 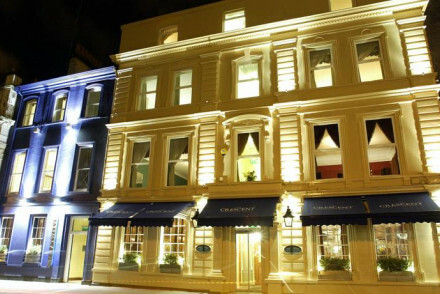 Featuring classy rooms and an excellent restaurant, it's a great base from which to explore Northern Ireland's capital. Local markets - Browse the local produce at St. George's Market. Sights nearby - Take one of Belfast's famous Black Cab tours. Great walks - Go for a walk in nearby Musgrave Park. A traditional property located in a leafy corner of Holywood yet within easy reach of Belfast city centre. Rooms are decorated in a classic style with antique pieces, rich colours, fabrics and vibrant wallpapers. There is a manicured garden and terrace. Enjoy the famous, first class 'Titanic' menu! Great walks - Picturesque St Patrick's Trail is just a 45 minute drive away. The Mountains of Mourne have routes available for all abilities. Sights nearby - The historic Carrickfergus Castle is worth a visit. 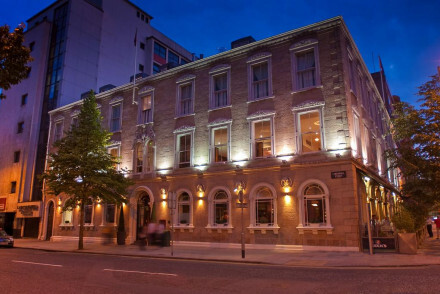 The Bullitt is situated in the heart of Belfast, the ideal spot for a city break. This designer property features contemporary and quirky interiors with plenty of artwork adorning the walls. Their funky rooms feature king-sized beds and satellite TVs. Breakfast on-the-go offered daily. A great stay. Local exploring - Be sure to see all that the city has to offer! Luxury hotel and spa overlooking Belfast Lough. Opulent interiors, great food and five star service. Ideal for a short spoiling break to Northern Ireland if you don't want to be in the heart of Belfast, and great for business travellers. A historic hotel located in the heart of the city. Smart rooms are spacious and elegantly styled with soft hues, sink-into beds and contemporary bathrooms. The Causerie Bistro serves exemplary dishes and there's also the Piano Bar for high-teas or prosecco filled evenings. Local exploring - Ideally located just a short walk from the city centre. Great walks - Take a stroll through the glorious Belfast Botanical Gardens. Stunning transformation of a former 19th century bank. Eclectic contemporary rooms evoke a romantic Napoleon III-style Paris - luscious velvets and silks, rich wool carpets, gold and red chintz wallpapers, and statement artwork. Superb bar, spa and gym plus a live jazz bar. Divine.